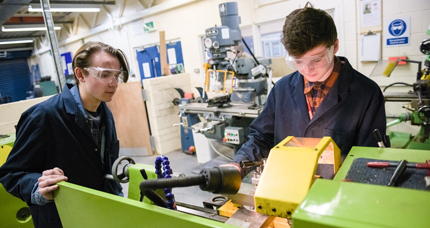 Vocational courses concentrate on giving you the knowledge and skills you need to transfer successfully from education to a professional hands-on workplace. At Brock we offer a wide range of highly-recognised and fully-accredited vocational courses that are designed to help you reach your early career goals. We also maintain healthy and dynamic relationships with employers who feed back to us constantly about what they want to see in new recruits. The Level 3 Diploma is a great option for you if you have done well at GCSE level but now wish to move on to a vocational course related to your career plans. All courses will help you develop the knowledge and skills you need for employment or Higher Education in your chosen field and some involve a significant element of work placement. Level 2 Diplomas are vocational courses that allow you to focus on the career area of your choice and develop the knowledge and skills that employers will be looking for. You will have the chance to choose a course that fits in with the strengths you have developed at school and with your future plans. Courses usually last for one year and you will need a number of GCSE passes at grade D or above to qualify. Level 1 Diplomas are usually aimed at those who are hoping to progress from GCSE and are working at a grade D-G. The courses aim to further basic knowledge within your chosen area and improve your competence in carrying out tasks relating to job roles within given industry. You may wish to take a GCSE subject alongside an A level or a vocational course. GCSEs can complement your College studies or improve existing grades. Designed for 16 – 19 year olds who may need to achieve qualifications in order to progress onto a Level 2 courses or into employment. Suitable for anyone wanting to develop their English, Mathematics or ICT skills. These can be taken alongside Level 1 and 2 courses, and could form part of an Apprenticeship.